Power monitor - Power consumption meter to check your usage & reduce electricity bills. With the way electricity prices are rapidly increasing of late, now more than ever it is important to monitor your power usage. Most manufacturers will include the power consumption rating for their appliance on a label, but are you sure it is accurate? Your appliance may say it uses 500 watts per hour, but does it REALLY? Power consumption can vary greatly from the manufacturer�s specifications, and by how the appliance is being used at the time. Power supply ratings are usually the maximum, but often they don't use their maximum rating. For example, a computer power supply may state it's power consumption is 1000watts, but it would be very rare indeed for it to use all of that 1000 watts. An accurate power meter is the only way to tell exactly how much energy you are consuming. Also, you may do things out of habit, and not realise exactly how much power you are using - even if you know a particular appliance's rating. Following is a personal example. For years I have run my TV through my AVR (Audio Visual Receiver), and 95% of the time I watch recorded TV on my home theatre PC (HTPC). Let's add that up, according to manufacturers specs: LCD TV - 175 watts per hour; AVR - 550 watts per hour; HTPC - 600 watts per hour. That's over 1300 watts per hour - just to watch television. And if you do that (eg) 5 hours per day, that's over 9000 watts per week! So, I thought it was about time I REALLY knew what my electrical appliances cost me to run, so I researched a lot of power usage meters, from very cheap, highly inaccurate units, to expensive trade-quality power monitors. Through my research, I've found what is a product which is not only a very accurate power monitor, but it is also quite reasonably priced too at around $200.00. This easy to use but very informative meter is good enough for tradespeople, but simple enough for the average householder to use. It comes with a "piggy-back plug" which simply plugs into your power point, and then you plug your appliance into the back of the plug. The Clipsal EzAudit (which only weighs 550gms) displays power, provides running cost and Greenhouse Gas Emissions, and it is particularly useful for measuring the electricity consumption of fridges, heating and cooling appliances such as air-conditioners, fan-heater, bar-heaters and the standby power consumption of appliances such as televisions, microwaves, and computers. Many of the cheap meters available will not reach down low enough to pick up stand-by power rates, and I've seen some rate something in stand-by mode as using 50watts, when in fact they are using less than ONE watt! A tradie has told me that the Clipsal EzAudit is accurate enough to pick up smaller wattages. By knowing which appliances use a lot of electricity, you can modify the way you use your appliances and can adopt new energy and money saving practices. In theory, the meter could easily pay for itself in less than a year. Turn off lights and other electrical devices when not in use. Change light bulbs to energy saving versions. Dim lights where possible to save energy. Install timers where possible to automatically switch lighting and other electrical devices off when not in use. Install motion sensors in indoor areas to ensure lights turn off automatically when the room is not in use. Great for infrequently occupied areas such as the walk-in robe, pantry, bathroom, laundry and garage. Install motion sensors in outdoor areas to ensure lights are only on when needed, and turn off automatically after use. Improve your safety and security while saving money at the same time. Reduce "Stand-By" power consumption by switching off electronic goods such as TV's, video's and game consoles at the power point when not in use. Remove all battery charging devices from mains when not in use. (e.g: phone, iPod, digital camera chargers). When upgrading appliances, ensure that you purchase the best Energy Rating. The higher the rating, the lower the energy consumption. Use Reverse Cycle Air Conditioning less frequently. Consider changing the temperature setting by a degree or two and enjoy the savings. Switch off heating / air conditioning at least half an hour before you leave. Install Airflow ceiling sweep fans to circulate hot or cold air as required. Insulate, and be sure to seal doors/windows. Use tumble dryers less and if possible dry using a washing line. Fill washing machines and dish washers to maximum for each cycle. Wash clothes on cooler temperatures (i.e. 40�C -> 30�C). Only boil the amount of water necessary when making tea or coffee. Consider using the microwave instead. Clean, repair or replace your older less efficient appliances. Heaters, air conditioners, refrigerators washers and dryers operate much more efficiently when air vents and elements are free from dust/lint, and when refrigeration gas levels are at optimum. Refrigerator door seals should be checked for damage and replaced when necessary. Undertake a home energy audit using Clipsal EzAudit. Identify appliances or practices that are inefficient. Eliminate unnecessary usage, minimise waste. If practical, install a Clipsal Cent-a-Meter to provide ongoing monitoring of your power consumption. To purchse the Cipsal EzAudit, check with your lcoal electrical supply store. Clipsal EzAudit Power Monitor Review By Rob Arnell, Senior Contributor at JustWeb Rating: 4.5 out of 5. 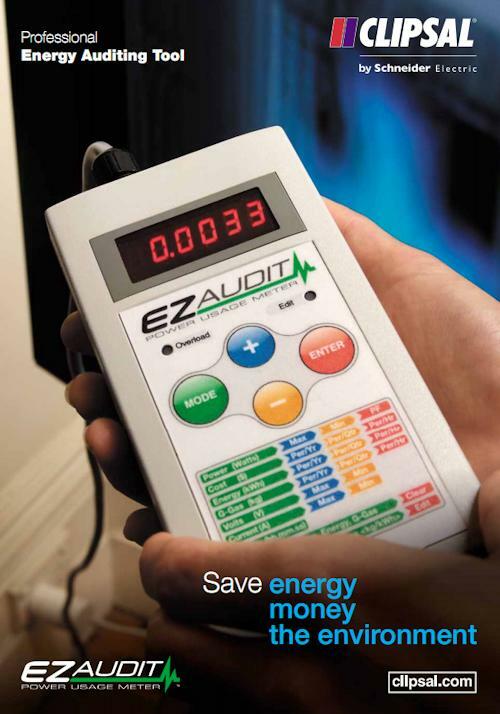 The Clipsal EziAudit power monitor is both easy to use and feature rich. It has the ability to check small power usage such as standby power, whereas a lot of cheaper units don't. Well worth the money to see exactly how your power is being used both at home and at work.